The trains between Edinburgh (Eastern Scotland) to Inverness (Highlands and Islands) are operated by ScotRail. The services on board may change depending on the train operator. 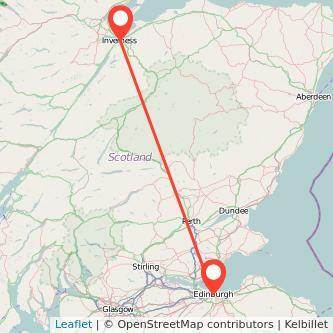 On average, it takes around 3h42m by train because of the 112 miles to travel to Inverness from Edinburgh. The journey time will change depending if the train is direct or with stops. The cheapest ticket price we've found to travel in the next month is £8.50 one way. Find the cheapest tickets to travel from Edinburgh to Inverness by train, bus, ride sharing and plane. When are the next trains to Inverness? The Prices for train tickets Edinburgh to Inverness are increasing if you don't book early. According to our data, if you buy your train 7 days in advance, you can find tickets from £21 whereas when purchasing your seat 3 days in advance, you will need to spend at least £29 for your train. Thus, you may save 28% on the price of your ticket by booking 7 days in advance instead of 3 days in advance. We compare train ticket for all major companies to travel between Edinburgh and Inverness by train and find the best prices for the coming days. Take a look at the prices of train tickets Inverness to Edinburgh and find the best deal for your outbound journey. The best way to spend less on your Edinburgh Inverness train ticket must be to have a railcard. While regional railcards exist in some areas, National railcards enable you to make savings on most rail fares across the United Kingdom. Everyone is eligible to at least one of the railcard, even non-UK citizens. National railcards available: 16-25 railcard, Senior discount card, Two together railcard, Family and Friends discount card and Disabled persons railcard. For your evaluation, you need to include the railcard cost, for instance £30, how much you're saving on each trip (i.e. : 34%) and the cost of your ticket. The average fare of a Edinburgh Inverness ticket is £29.65 (1). Divide the railcard cost by the saving: £30/34%= £88. Now divide £88 by £29.65: £88/£29.65 = 2.97. It will take you approximately 3 trips from Inverness to Edinburgh (one way journey) with your railcard to be profitable.